Come by the Bioscience and Natural Resources Library on Cal Day, Saturday, April 21, 10am – 3pm. 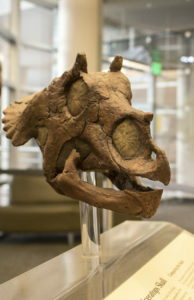 Marvel at the dinosaurs in the Valley Life Sciences Building and peruse the library’s collection of dinosaur books for all ages. View research posters by Integrative Biology honors undergraduate students. Watch the documentary about renowned scientist Marian Diamond, My Love Affair with the Brain. See reproductions of engravings from the Banks’ Florilegium, a collection that documents plants collected by Sir Joseph Banks and Dr. Daniel Solander during Captain James Cook’s first voyage to the south Pacific Ocean. Other unusual and rare items from the Life and Health Science libraries will also be on display.